Reserve Officers Kevin Burke and Randy Mehringer are working patrol in Rampart Division on Friday, June 17th (the same day, coincidentally, that O.J. Simpson was evading police in a Ford Bronco). Officers Burke and Mehringer observe a suspicious vehicle driving erratically near MacArthur Park. They conduct a traffic stop that escalates into an investigative stop, resulting in a successful unreported-stolen-vehicle arrest. Kevin Burke is now the Chief of Police for the city of Lakeport, California. He worked as an LAPD Reserve Officer for 11 years while he was a Deputy Prosecuting Attorney in Orange County. In 1996, he went full-time with LAPD and made Sergeant three-and-a-half years later. He grew up in Lakeport, a small wine-country town of 5,500 located on the west shore of Clear Lake. When the position of Chief of Police became available, he applied and was appointed. 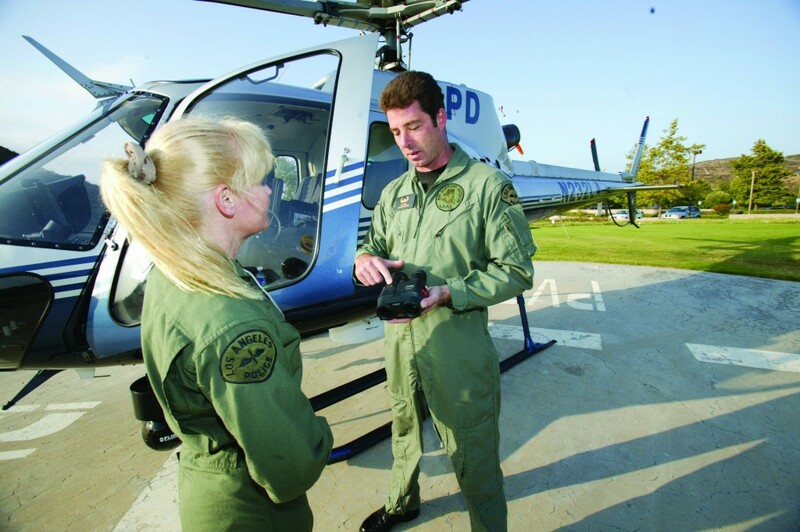 The LAPD Reserve Corps can be a launch pad for many seeking lifetime careers in law enforcement. “I was looking at my Academy class photo the other day,” says one officer, “I’d say over half my classmates went on to full-time careers, in LAPD or elsewhere.” On the flip side, many full-time LAPD officers, who retire or otherwise decide to leave the job, become reserve officers. At West Traffic Division, there are at least three reserve officers that have gone full-time and three full-timers who are now reserve officers. In his book, Citizens Defending America (University of Pittsburgh Press, 2005), Martin Alan Greenberg describes how reserve law enforcement units, especially in the western states, have evolved over the years, and how they differ substantially from the “auxiliary police” concept one finds primarily on the East Coast. Reserve units are “under statutory provisions” and are held to a level of training and professionalism similar, if not identical, to that of full-time positions. It is this professionalism that joins full-time officers and reserve officers. Deputy Chief Terry Hara was a reserve officer with the Long Beach Police Department before coming onto LAPD full-time. Chief Hara says he has been particularly impressed over the years with how the LAPD Reserve Corps has become an integral and respected part of today’s Department. If you ever met Reserve Officer William “Andy” Anderson, you would know it, for his uniform sleeve is covered with service stripes from top to bottom. He became a LAPD reserve police officer in 1948 after serving in World War II as an Army-Air Force photographer. He was attending Santa Monica College on the G.I. 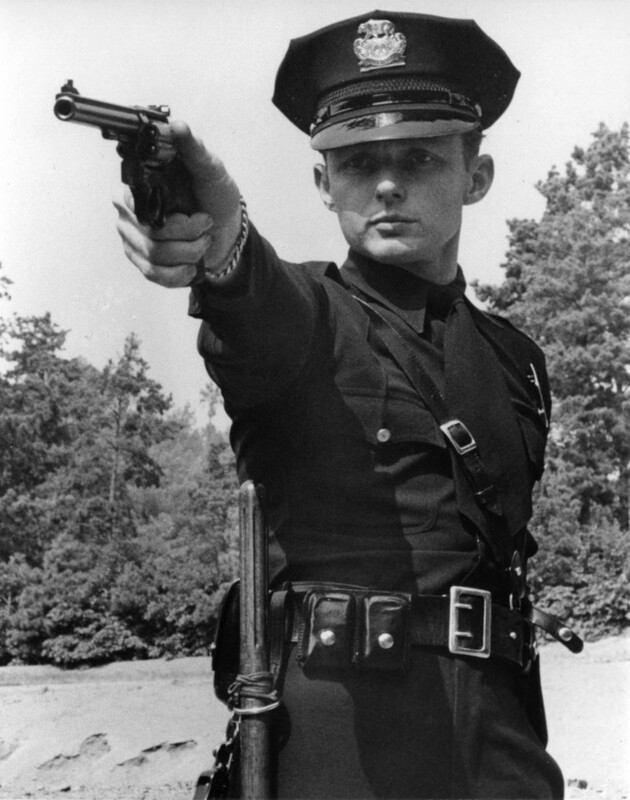 Bill, and working as a police beat news photographer, when he heard about the reserve program: “The officers at the time said, ‘Andy, you spend so much time with us here, you should become a reserve officer.’” In 1950, he was recalled to military service and his Reserve Academy training got him noticed for a position with the Air Force’s Office of Special Investigations (OSI), in which he subsequently spent four years in European operations, stationed in Germany. Back home in 1955, he went full-time with the LAPD, working for 31 years, much of it in the Bomb Squad. He retired in 1986 and became a reserve officer again, a position which he still holds. If you’ve been adding up the numbers, you can see that Andy Anderson has been with the Department for a total of 55 years—31 years as a full-time officer and 24 years as a reserve officer. Andy’s son, Scott Anderson, is a Master Gunnery Sergeant in the U.S. Marine Corps and has had three deployments in Iraq. He joined the LAPD as a line reserve officer in 1993. Jay Roberts Jr. was acting in movies in the early 1990s, and starred in six films. In 1993, he went through the line Reserve Academy, taking on the job of producing the recruit class video. He worked a patrol assignment in Hollywood for a period and finished a film in 2004 with actor James Brolin, before deciding to become a full-time officer. Today, Lieutenant Roberts is working on loan at the Topanga Gang Impact Team (GIT). He has also served as the Topanga Area Mid-PM Watch Commander and as Office of Operations Aide to Commander Kirk Albanese, who has since been promoted to Deputy Chief. You may recognize Lieutenant Roberts, as he was featured in photos and mini-movies as part of a 2004 Department recruitment campaign, and you can still see him on the joinlapd.com website. Twenty-five years ago, Teresa Lincoln was in an administrative/secretarial job when she developed a single-minded goal: to fly helicopters for the LAPD. She entered the Academy, put in five years on the street and then applied for a position with Air Support. She was selected for pilot training and achieved her goal and became a Command Pilot. When she retired from a full-time position with the Department, she became a reserve officer. While still active with Air Support, Officer Lincoln has also headed up the Reserve Speakers Bureau. Sergeant Gary Chilingarian, currently assigned to North Hollywood Area, went through the Academy three times—as a technical reserve, retreading as a line reserve and then again as a full-time officer, in the lateral program. Now the Department is implementing new procedures, based on recent state legislation, providing for the fast-tracking of qualified reserve officers to full-time officer positions. On July 1st, California’s POST was amended as follows: If you are a Level I Reserve Officer (with the basic course under your belt) you can lateral to a full-time position with the same agency without repeating basic entry/testing requirements. The state will require that the officer complete a minimum 400-hour FTO program. Individual agencies may add additional requirements. On July 28th, Commander James Cansler, Captain Joseph Mariana and Lieutenant Craig Herron met with 23 LAPD reserve officers who have expressed an interest in becoming full-time officers. Captain Mariani, the Commanding Officer of Recruitment and Employment Division, provided the details on the Department’s planned reserve-to-full-time opportunities. It will be similar to the Department’s restoration process. Some updated testing, such as medical and physical, will be required. Qualified officers will need to complete an abbreviated training program and will be subject to an 18-month probationary period. Los Angeles Councilmember Dennis Zine was a full-time LAPD officer, rising to the rank of Sergeant and elected three times to the LAPPL Board of Directors. He became a reserve officer in 2001. Los Angeles District Attorney Steve Cooley served as an LAPD reserve officer from 1972-1978. LAPD officers keeping the peace during the Lakers celebration. 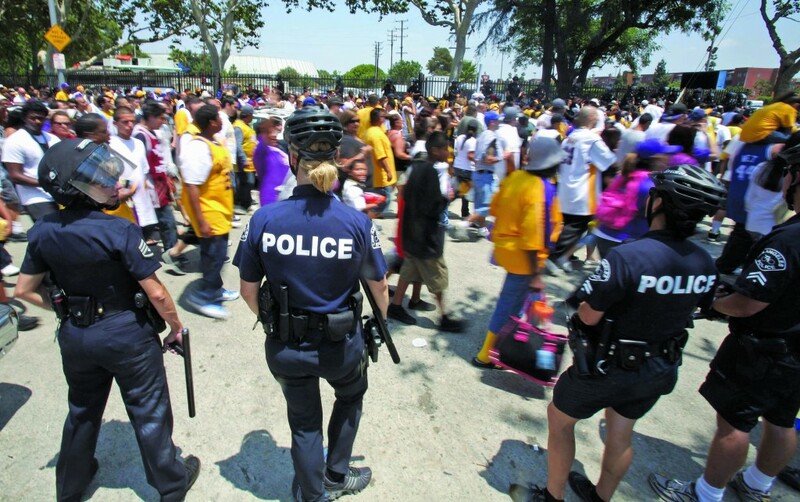 Reserve officers were an integral part of the deployment for both the Lakers event and the Michael Jackson memorial. William “Andy” Anderson, who has spent a total of 55 years in the LAPD—31 years full-time and 24 years reserve, and he is still on the job today. Left, LAPD Air Support Command Pilot and current Reserve Officer Teresa Lincoln with partner, Reserve Officer Lance Ordin.